WHAT DO THE DIFFERENT COLORED BELTS MEAN? Our belts reflect a member’s proven level of competence and symbolizes an inner journey that never truly ends. In order to achieve a higher rank, students must demonstrate their growing proficiency in martial arts. Thrive Martial Arts has nine colored belts listed in order of accomplishment: White, Orange, Yellow, Camo, Green, Purple, Blue, Brown, Red, and Black. WHAT DO THE STRIPES ON THE END OF THE BELT MEAN? 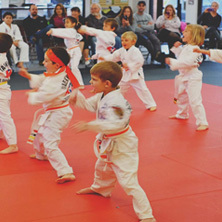 Throughout a testing cycle, students earn multiple stripes for their belts by demonstrating proficiency in different aspects of their training — from pattern memorization to technique improvement and so on. Each stripe is considered a mini “rank advancement” and is a great opportunity to celebrate their accomplishment. HOW DO I ADVANCE BELT LEVELS? Belt testings occur every 8 to 10 weeks. Instructors will communicate with the participant prior to each testing session and let them know if they are ready to test. 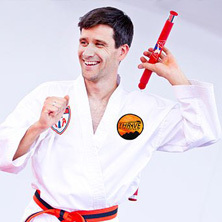 Each belt has its own “form” which students must memorize and master — this is the biggest component of belt testing, but other aspects are tested as well. 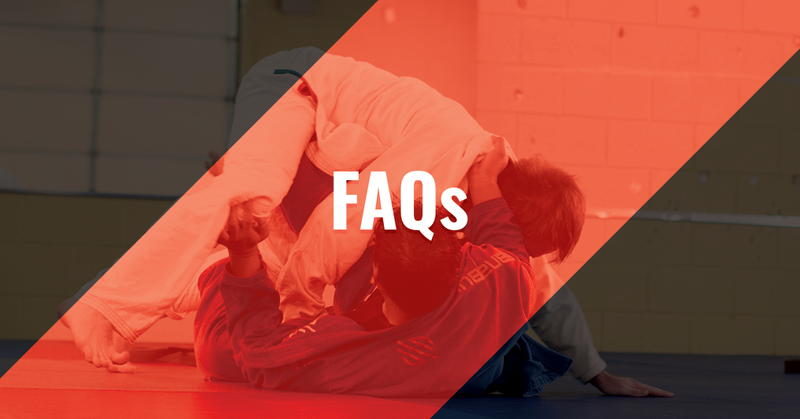 HOW LONG DOES IT TAKE THE AVERAGE PERSON TO EARN A BLACK BELT? Students who show dedication, attend class regularly, practice outside of the studio, and make Taekwondo a priority can earn their black belt in 3–4 years. WHAT MARTIAL ARTS ORGANIZATION IS THRIVE A PART OF? 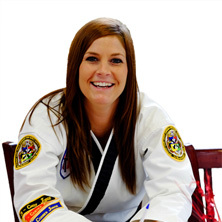 Thrive is under the American Taekwondo Association. ATA International is the world’s largest organization dedicated to teaching martial arts to the entire family. With licensed locations around the globe, there are over 950 independently owned and operated ATA facilities. Licensees of the ATA have trained over one million students since ATA’s inception in 1969. Since that first class was taught many years ago, the focus of ATA International has remained the same — to provide students with the highest quality martial arts curriculum available in a fun and positive learning environment that people of all ages can enjoy. DO THRIVE STUDENTS COMPETE IN TOURNAMENTS? Competitions are highly encouraged, as they’re a great way to build confidence. Thrive offers two “in school” tournaments a year that are great learning opportunities. Additionally, ATA offers four tournaments a year in Colorado, with an event somewhere else in the world every single weekend. HOW DO TRIAL MEMBERSHIPS WORK? Any individual interested in participating in one of our programs is invited to try their first class for free. Upon completion of the class, participants will be offered a trial membership for a low cost of $55 for 5 classes. During this time, students and their families will be able to see what makes Thrive Martial Arts the leader in Northern Colorado for quality taekwondo instruction. 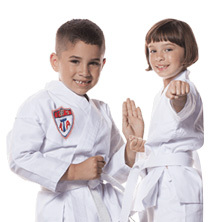 THRIVE SOUNDS LIKE A TERRIFIC MARTIAL ARTS SCHOOL, HOW DO I GET STARTED? Step 1: Fill out our contact information page so that we can contact you to schedule your first FREE no-obligation trial class. Step 2: After class, sign up for your five class trial membership. *Our locations offer both month to month, as well as discounted memberships for longer-term commitments. Talk to one of our staff members to find the membership that works best for you.